Home / home decor / makeup storage / vanity / "By reshaping or decorating our outer selves, we express our inner sense of self: 'I like that' becomes 'I'm like that.'" "By reshaping or decorating our outer selves, we express our inner sense of self: 'I like that' becomes 'I'm like that.'" If you follow me on Pinterest, you'll know that I'm a huge fan of home decor, with 11 boards dedicated to different rooms and styling tricks. Needless to say, I'm itching to redo my bedroom (and the rest of the house, but we will leave that until a later date). I'm quite limited when it comes to decor, as my room is only 10X11 feet, and needs to work as a bedroom and home office for school and blogging. 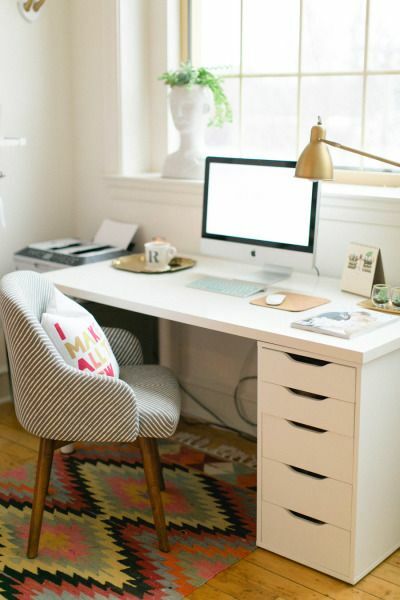 The first item on the to-buy list is a new desk/vanity. I purchased one from Crate and Barrel before I started university, and it's already completely falling apart. The paint is peeling, the drawer doesn't stay closed, and the front ledge is all chipped and bumped. I purchased an expensive desk before, thinking it would last for years, but I'm so disappointed in the quality. This time, I'm looking to Ikea in the hopes of finding a replacement. In my mind, there are three viable options, but I was hoping for some advice from some of you who may have some of these styles, and would love to hear what you think of them. 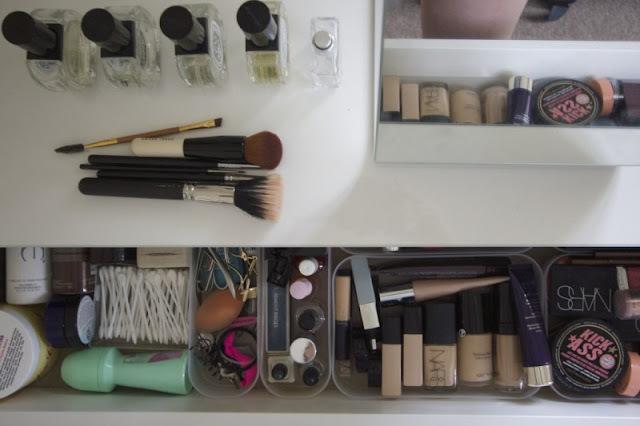 I think the Alex drawers may be the most well known Ikea beauty storage solution. It's practical and chic looking, and can easily hold different containers to organize all of your makeup and paperwork. You can also customize it to be as short or long as you need. On the downsides, it's quite wide, and you would need to keep opening and closing drawers trying to find why you need instead of having the convenience of one easy to access drawer. This option is the only actual vanity option in the running. Technically, it's about the size of my current desk, but is a blank canvas on the inside (mine has a bunch of pre-establish dividers that make organization more tedious than necessary). 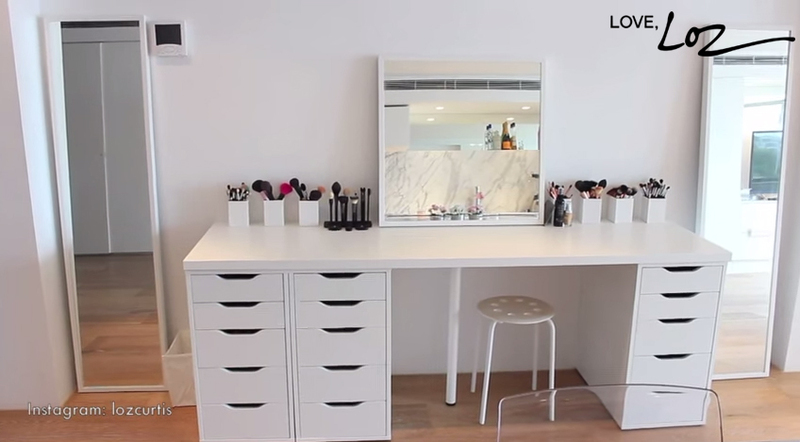 Naked palettes can actually stand upright, and there is a glass top that makes wiping down any spillages an easy task. My only reservation is that it might be a bit too small given that I need to to perform double-duty. If we are being completely honest here, I think this one is leading the pack right now. It's narrow, compact and sleek, and can easily be repurposed down the line into a console or dining buffet if need be. 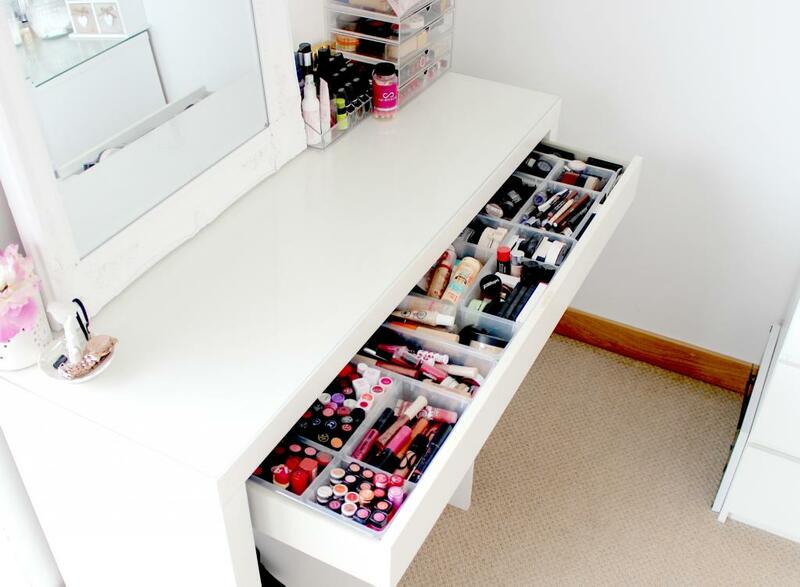 The two drawers would be ideal, as I could keep my makeup on one side, and paper stuff on the other. I'm just not sure about the width of the drawers. I may need to take a trip back to Ikea soon with some makeup palettes and lipsticks in hand to see how well they fit and stack up against the Malm. Obviously, I'm not limited to just these three options. I could choose just one, or a combination of some of the options, or completely veer off course and choose a fourth option altogether if I see something I love. 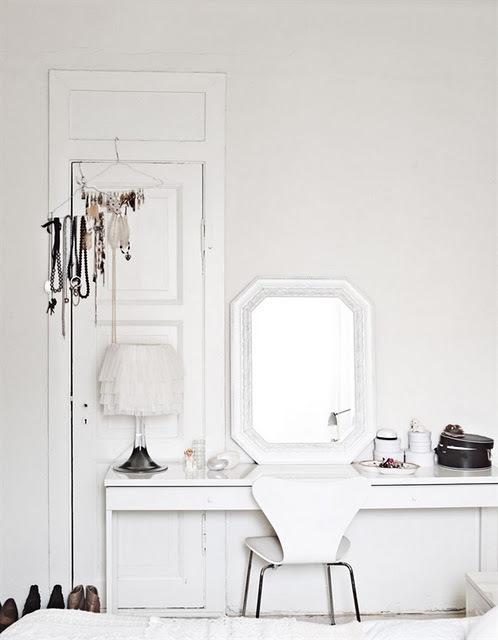 While I still have some saving up to do, I'm looking forward to revamping my vanity. Any and all suggestions are greatly appreciated!